The last of Honda’s six new models for the 2013 model year (checkout our coverage of the 2013 Honda CBR500R, 2013 Honda CB500F, 2013 Honda CB500X, & 2013 Honda CBR600RR), the 2013 Honda Gold Wing F6B is in a class of its own. If the traditional Honda Gold Wing is the Cadillac of the motorcycling world, then the Honda Gold Wing F6B must be what the bike looks like with a drop-top. Taking the huge weekend touring machine, Honda has made the Gold Wing F6B more of a day-to-day cruiser…but not in a horrible Honda Rune sort of way. 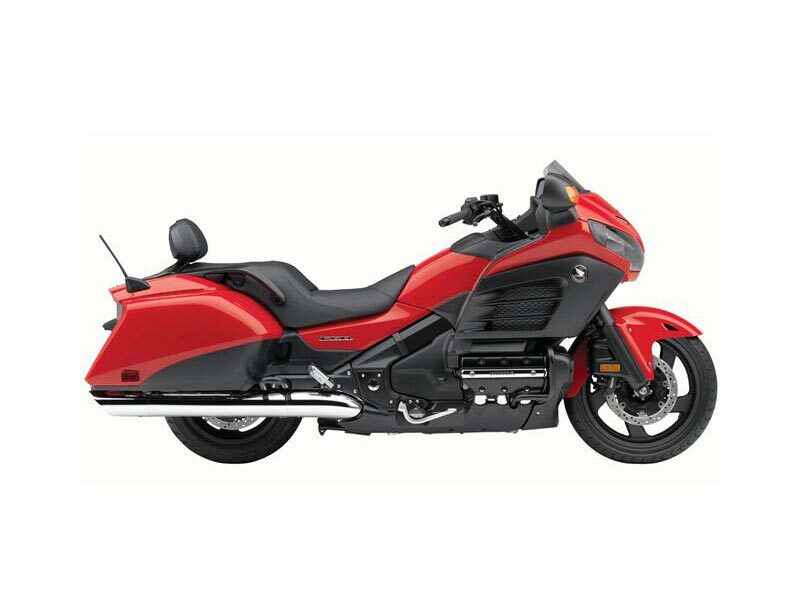 Using the same chassis and 1,832cc flat-six motor that is found in the Honda Gold Wing, the 2013 Honda Gold Wing F6B not only looks like less motorcycle than its predecessor, but it also sports 62 lbs in less heft than the base tourer model, for a “curvy” 842 lbs curb weight. Coming in two models, the Honda Gold Wing F6B will cost $19,999, while the Honda Gold Wing F6B Deluxe will cost $20,999, and will include a center stand, passenger backrest, and self-cancelling turn signals. Color choices are simple: black or red. Photos and tech specs are after the jump. Miles Per Gallon TBD – Miles per gallon values are calculated estimates of fuel consumed during laboratory exhaust emissions tests specified by the EPA, not during on road riding. Use for comparison purposes only. Your actual mileage will vary depending on how you ride and maintain your vehicle, weather, road conditions, tire pressure, cargo and accessories, rider and passenger weight, and other factors.